Discrete, solid, sporty and sober, really nice blue backlit round digital meter TNT TUNING, in addition, it is available in aluminum or carbon imitation! Here is a very nice little counter TNT equipment manufacturer (ACSUD group), high quality meter is manufactured by a large well-known designer in the middle. Several advantages are offered by this counter. First of all it is very easy to mount! It comes with easy mounting on handlebar and an attachment 1 point, which lets you choose the look and secure as you wish. This fixation is on silentbloc to dampen the vibration of your machine. Color level there are two choices, and carbon black which provides a sober and racing and finally chromium and aluminum but sober enough custom. The presented blue color is unavailable (out of production). 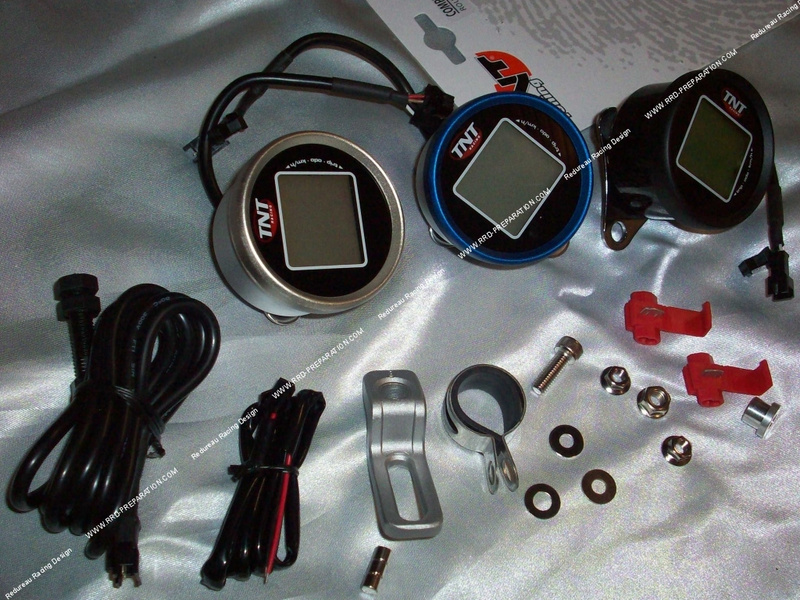 This meter comes with instructions, it is obviously adjustable according to the size of your wheel so given the exact speed and accurate It records daily mileages, the maximum speed, ... For the speed sensor is simple enough, the fixing is delivered, the course also magnets. It is blue back lit, which is ideal for the night (extra style.. The sentence trip odo Km / h is also lit in blue). Let the connections, again very simple! A red (for +) and black (-) for connected 12v (battery or output lighthouse ...) and that's ok. It saves your settings. For submission to zero very simple, a small button hidden behind the counter supported with a mine. Clearly and to close this small counter is lightweight, stylish, durable, water resistant and accurate! I think it will appeal to all the world especially has a great price!